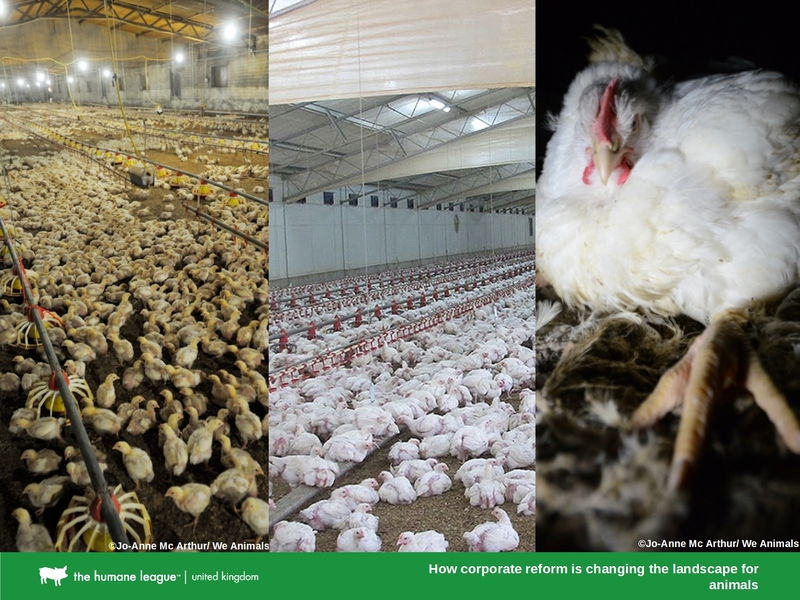 Vicky Bond: How Corporate Reform is Changing the Landscape for Animals - EA Forum, or read the transcript at effectivealtruism.org. Today, I'm gonna be presenting on how corporate reforms is changing the landscape for animals. But before I do, I'm just gonna give you a little bit of background about The Humane League. The Humane League was founded back in 2005 in Philadelphia, started off very much as a grassroots activists' organization, just a couple of people. We've now grown to over 80 staff. We are now in other countries. In Mexico, we have a team. We have a team here in the UK. We've been here in the UK for a couple of years now. We're recently registered as a charity. We're also based in Japan, which is the hub for many food businesses in Asia. Four or five years ago now, the Humane League honed in on getting hens out of cages. It was work with corporatations, getting corporate commitments, that's been helping make change for hens. Other organizations have been doing more positive outreach. Then we took the approach that we would have discussions with companies, but, if those discussions didn't work in getting any kind of commitment, we would launch campaigns against these companies to get them to end cages for hens by 2025. We, along with a number of organizations, such as Mercy For Animals, Animal Equality, and HSUS, to name a few in the US, have been working on this. 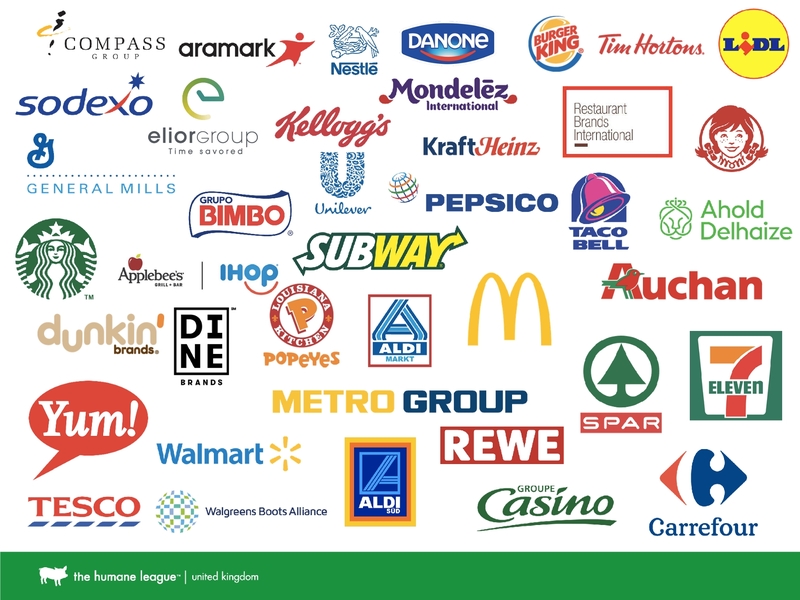 In doing so, we've got over 300 companies in the US to commit to go cage-free by 2025. A similar approach has been taken here in Europe. A number of organizations are working on this here, too, like Open Cages, L214, and ourselves. 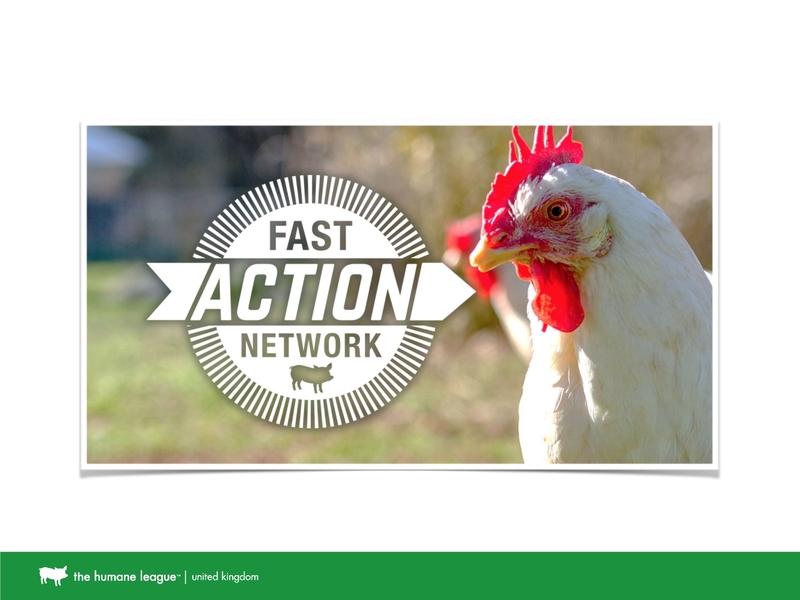 Compassion in World Farming have been working a lot in the UK prior to us coming in 2016, and have been making progress to get commitments for cage-free. 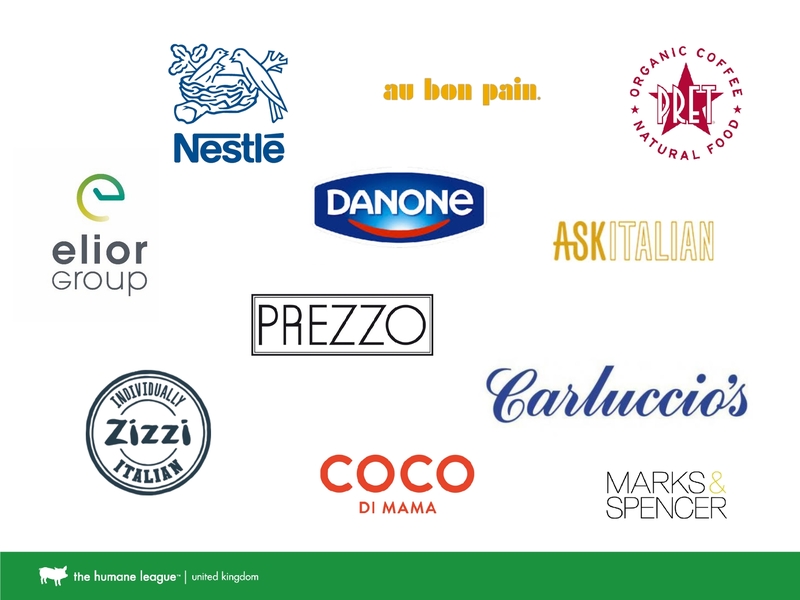 Now, here in the UK, all major companies have committed to go cage-free. This is the battery cage. This is what we're talking about. Here, in Europe, we banned this in 2012. However, in other countries, pretty much around the world, this is the system in which hens will spend their lives. That's for a year and a half. They'll be in these systems. There is no more space than an iPad for them to live. They can't spread their wings. They are only given food and water. In Europe, we banned this in 2012 and moved to the enriched cage. Now the enriched cage was meant to be a step up and, in some ways, there is a degree of improvement. The birds have small area where they can lay their eggs. You can see the orange flaps. That's where they'd be able to put up, where they want to lay their eggs because they prefer to be in a dark, enclosed space. That's not quite what that is, but it is better than the barren cage. They want to perch up high at night to feel safe. The enriched cage does have some perches. Unfortunately, those perches are very close to the ground of the cage. They're on a wire cage for their entire lives. There's a small scratching area. Again, they can't really do dust bathing or foraging in that properly. That's why we pushed for the cage-free. Now, this is a more intensive system than what these systems look like typically. These barn systems do provide more for the hens. They're free to move around the system, move around the barn. They have litter on the floor for which they can dust-bathe and forage. They have perches, which they can perch up high at night. You can't see here, but then inside, there's nest boxes. They are dark, so the hens can have a secluded place to lay their eggs. 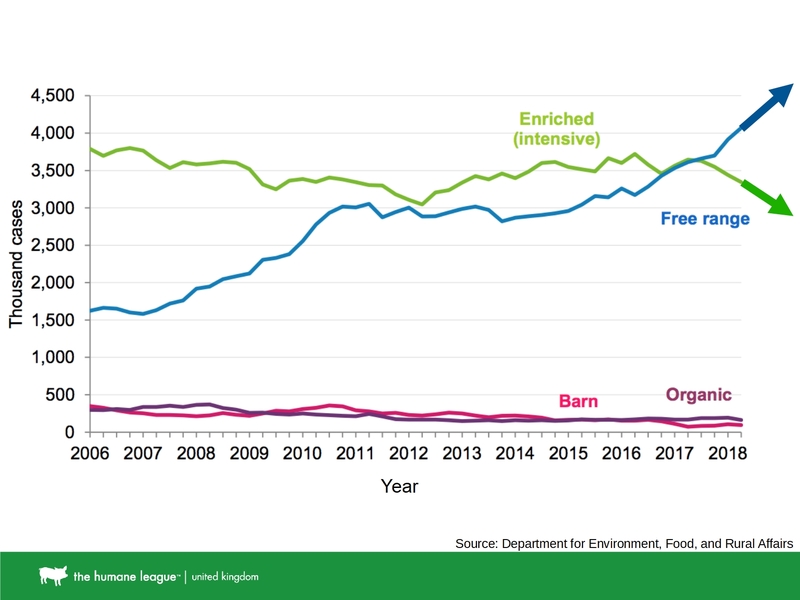 As we go through the welfare potential of systems, of course, free-range would be the highest welfare potential, allowing birds outside to forage even more naturally and to have natural light, et cetera. Through these approaches, we've been working with other organizations to get major companies to make commitments. That includes Compass, which is major food service company. People like Kellogg's and manufacturers, all the major fast food chains, and also the supermarkets. Thees commitments aren't just in one country. These commitments span both Europe and, in some case, globally. How do we know this approach is working? Well, this is Chad Gregory. Chad is president of UEP, United Egg Producers. He helpfully told us that, "They're the ones that are driving this. There is no question about it. 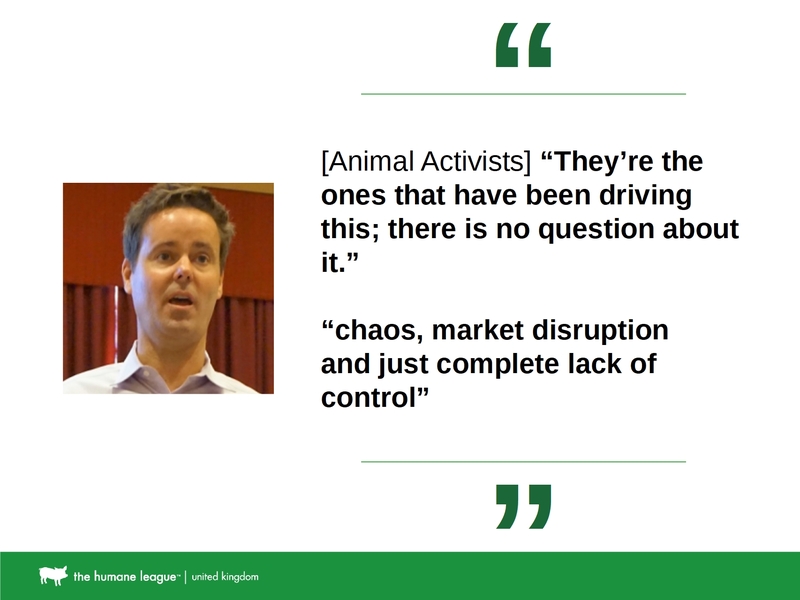 Chaos, market disruption, and just complete lack of control." There we are. We can also look at the figures. What we're seeing is, if you look back in 2010, before this corporate campaigning happened, the numbers are really stagnant, going up very little every year. In 2010, we had 4.4%. Now, we look to 2017, and we're at 15.6% of hens in cage-free systems. Actually, USDA reporting this month on month, we're actually up to 17.9% last month. So we're actually beginning to see change happening right now in real time. Here, this is the UK. 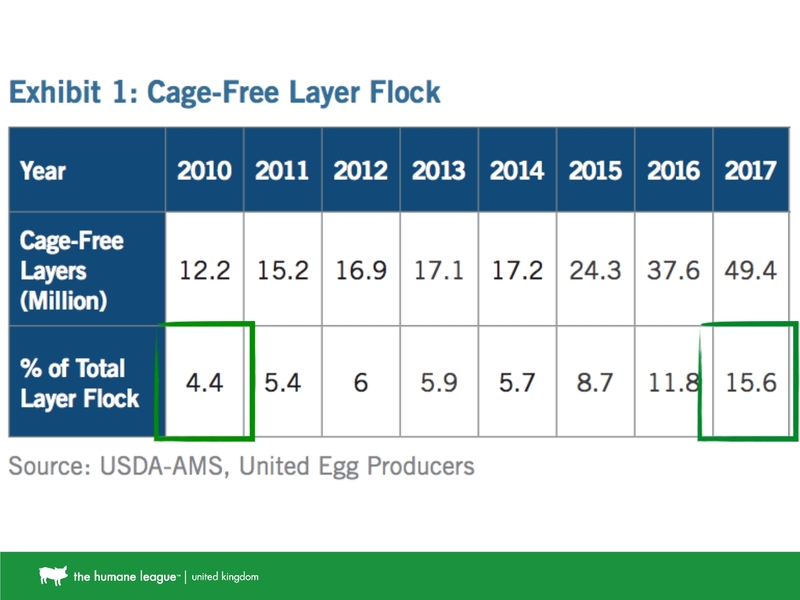 There's been a lag period for a while between 2012 and 2016, where there really hasn't been a huge amount of change in getting hens out cages. Come 2016, we started getting the rest of those major companies to commit. 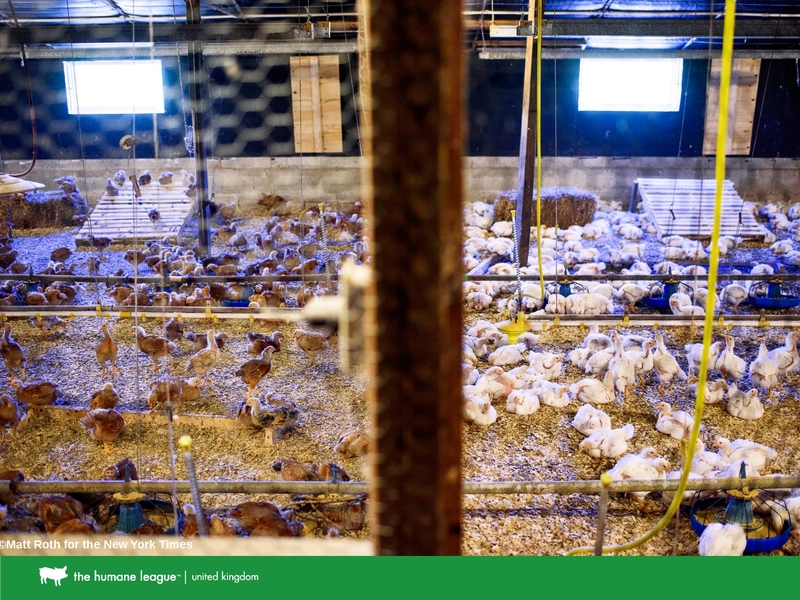 We worked very much on getting Noble Foods, the largest egg producer in the UK, one of the largest in Europe, to commit to go cage-free as well. We now see free-range is moving up and the enriched cage is moving down. Before that, it had been pretty plateaued for a while. We talk about numbers. Hens suffer in very huge numbers. They also suffer for a prolonged period. These birds will go into cages for all their lives, and they'll be slaughtered at around 70 to 90 weeks of age. The suffering would be prolonged even if there weren't vast numbers. But yet, the numbers are pretty large; 38 million in the UK, 320 million when we talk about the US, and nearly 400 million in Europe, and actually worldwide, 7.6 billion. The numbers are big, and the longevity of suffering is long. We have the Open Wing Alliance. 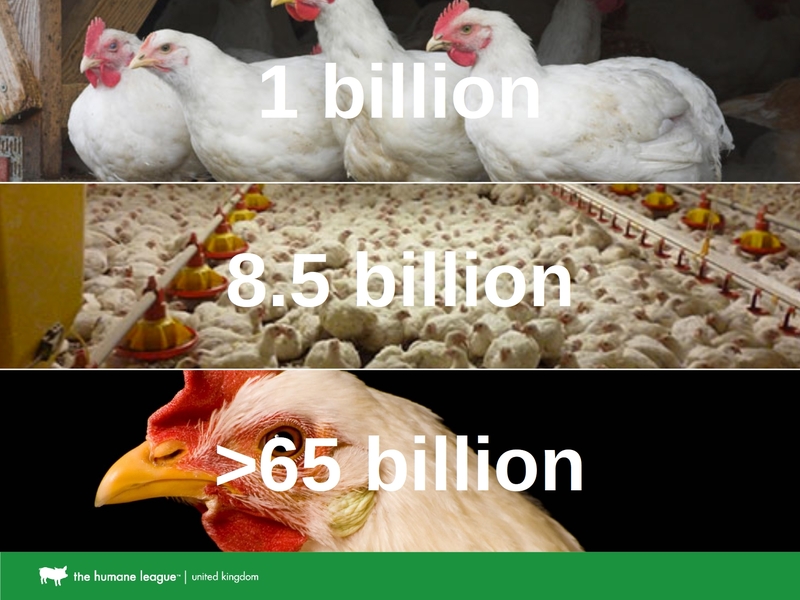 We need to tackle this 7.6 billion hens. We need to get them out of cages. The majority of which are in those cages. The Humane League initiated the Open Wing Alliance. We brought together members from around the globe to come together and unify a front to get hens out of cages. We share campaign strategies, and tactics as organizations. We share resources around the world. We have 59 organizations in 57 countries now. You can see here the black, indicating where we are. Month on month, new organizations are joining. We give grants to these organizations in areas where they might not otherwise get monetary support. This allows activists on the ground to begin work in their countries, where there just hasn't been the monetary support to allow them to do corporate campaigning or any real farm animal campaigning. We also know that the industry is paying attention. In New Zealand, this is from the Weekly Times. 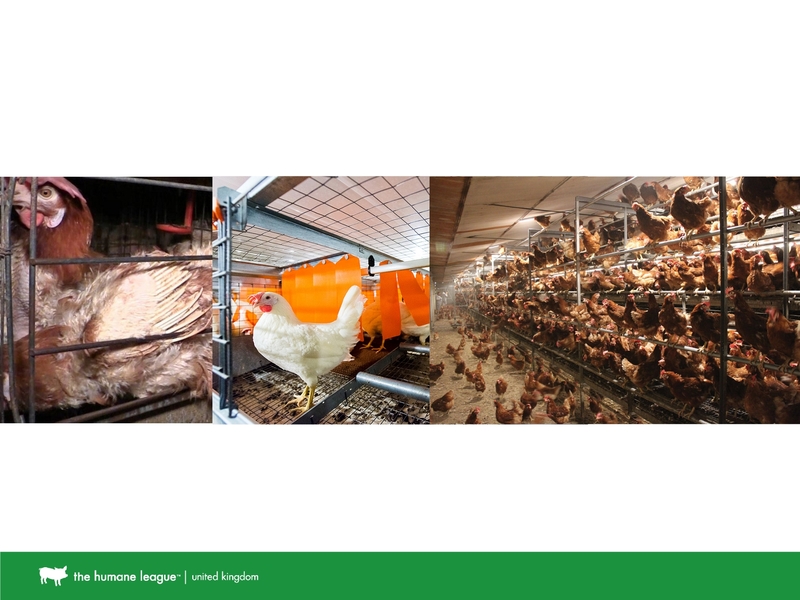 In New Zealand, they banned the barren battery cage and required the enriched cage, as we did here in Europe. But the industry said, "Don't bother. Let's learn from what's happened in Europe. These European producers are now having to go into cage-free already. They've only just changed, converted to enriched cages. Really, the global shift is happening. It's come to New Zealand. It will come, and we might as well go cage-free." South Africa has also put out in the industry magazine: "The cage-free revolution is moving rapidly through the world. South African egg industry should make sure they're prepared to accommodate that change." 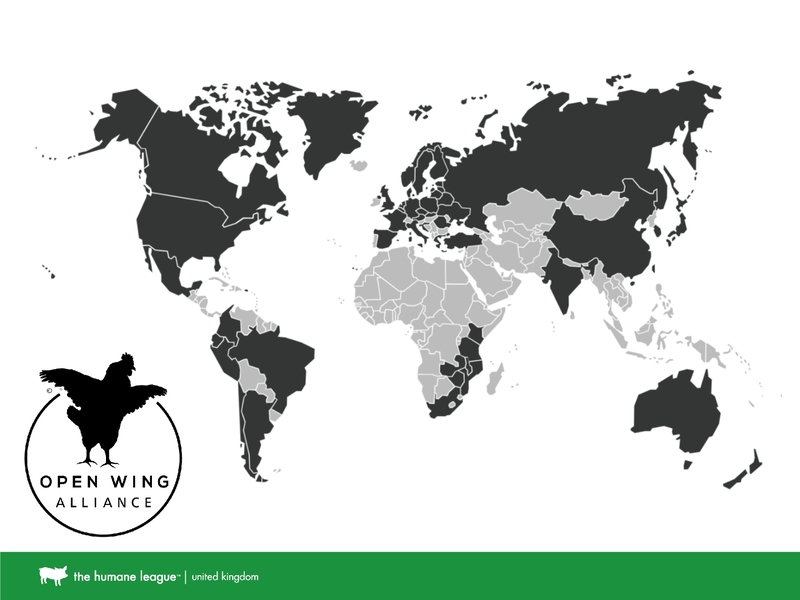 As this has been going on worldwide now, organizations are working on cage-free in countries like the United States, and here in Europe, the United Kingdom and Sweden, for instance. We're actually shifting now to look at chickens raised for meat, or broiler chickens, as they're known by the industry. The numbers of these animals is vast. One billion in the UK. We're the second largest producer here, only second to Poland; 8.5 billion in Europe, around about the same amount in the US, and over 65 billion worldwide. These birds account for nearly 95% of all land animals being produced for food. While the degree of time that they're on this planet, which is six to seven weeks, is pretty short, the numbers are vast. Standard, intensive chicken rearing very much looks like this. It's a barren barn. The chickens are on litter. When they're younger, they have a bit more space because they're smaller, but there's tens of thousands of birds in one single shed. They start like this. As they grow, they have a lot less space. They're in this until they're slaughtered at six to seven weeks. In that time, they'll suffer from conditions like painful leg health problems, metabolic diseases. Because their legs are painful, they don't want to move around so much. They sit down on the litter a lot. This can lead to blisters from the ammonia on the litter that they're in for the whole time. In fact, their growth is such that they grow six times faster than they would have back in the 1950s. They've been genetically reared so that they produce a much larger breast muscle. It becomes very evident when you look at them, that the industrial breeds of broiler chickens are much worse off. The stature of the birds has changed. No longer standing really upright, but actually having to widen their stance to accommodate the larger breast. This change in stature means that the birds tilt forward. It changes how the center of gravity is, and it makes it harder for them to walk. Their actual skeleton is under a lot of pressure. It has to grow so rapidly. Here's a research project that's going on over in the US at Purdue, which shows the lethargy these birds suffer. The red birds, which are a welfare breed, are moving around. There's lots of activity. But then, if you look at the white birds, the majority are sitting down. If they're not sitting down, they're at the food or the water. Of course, these birds grow so quickly that they need to be eating continuously. When they're not eating, all they're doing is resting. Now, these birds still have the same mental capacities as the other birds. It's just, unfortunately, they're trapped in their own bodies and unable to behave how they would choose. At six to seven weeks of age, they will be taken to the slaughterhouse. Now, typically, that's a waterbath system. This means the birds are hung upside down by their legs. They will go through a tank of water that has an electric current, that will run from the head to their feet. That should give them an electric shock to make them unconscious before their throats are cut. However, unfortunately, the system was made for speed and not actually for welfare. We're talking about 140 to 180 birds going through this process every minute. This system often doesn't actually give these birds an appropriate electric shock to make them unconscious. In fact, many of them are conscious when they get to having their neck cut. For those that have their neck cut poorly as well, they may make it through to the scalding tank. This is to remove the feathers. But if they're still alive, they will obviously experience the scalding tank fully conscious or part conscious. That's estimated to be around 2% to 3% in the US that suffer from that. Actually, the Trump administration has also just allowed the speed of the line to go up even faster. There is an alternative, controlled-atmospheric stunning, which uses either carbon dioxide or inert gases to induce unconsciousness, and then the birds will die and then the throats are cut. Now, this means that they don't have to be handled in the same way. Where the waterbath system, they're hung up by their legs, which is painful. The legs are weak, as we were saying. They don't have a diaphragm so actually their insides crush their lungs. By not handling them and keeping them in the crates, they don't have to experience this. With controlled-atmospheric stunning, they are likely to become unconscious and then killed versus a stun, which may actually just be an electric shock before they experience their neck being cut. There are a lot of things that we can do to improve the welfare of broilers. We came together in the US and in Europe with the animal welfare specialists from different animal protection organizations, and came and listed some criteria to improve the welfare of meat chickens. These included changing the breed, having a higher welfare breed. So that their legs are healthier, and they don't suffer from so many metabolic diseases, for instance. We also want to increase space. These birds want to move around. They need space in the shed, so we've lowered the stocking density and provided enrichment in the shed, so pecking materials to keep these birds active, like straw bales. We've improved the lighting, provided natural light here in Europe. We insist on controlled atmosphere killing. This means, the birds won't have to go through the waterbath system. We also want to make sure that companies actually do this. For that reason, we're asking for third-party auditing and the companies each report year on year or what progress they're making towards this. Now, over in the US, they've been doing this for a year or so now. In doing so, they've got many major companies, over 95 now, to commit to this standard. 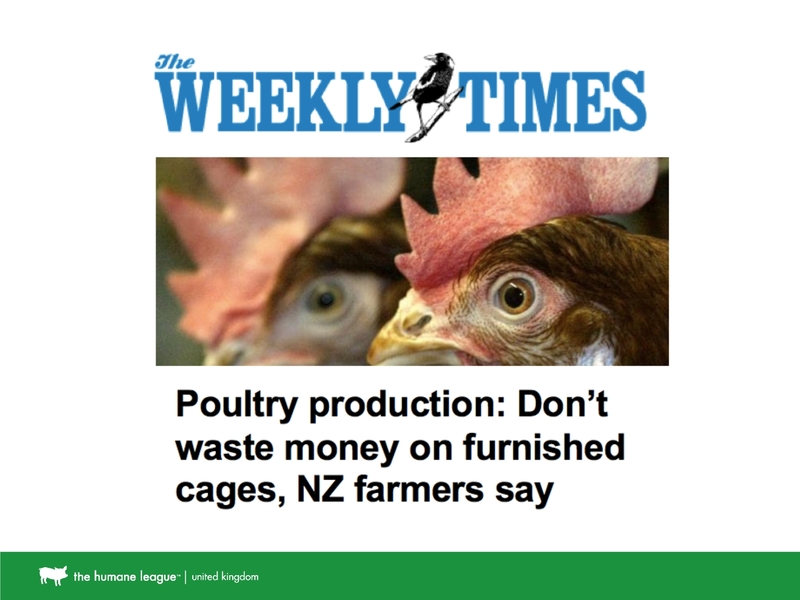 They're committed, by 2024, to improve the welfare of their chickens in their supply chain. Here, in Europe, we're just beginning with this over in the UK and France, for instance, and Germany. In doing so, we've got Elior Group, Nestle. 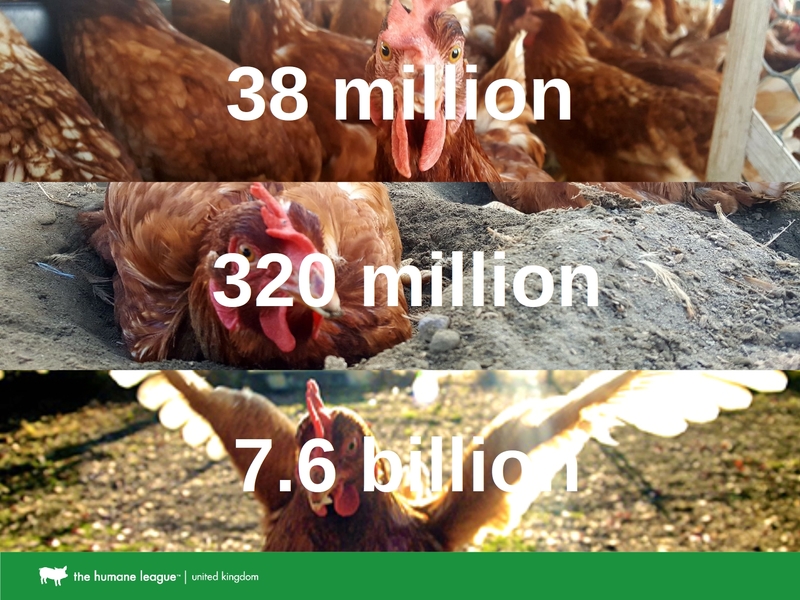 They're known to commit to making to the European chicken commitment, and that's expanding over the whole of Europe. Some of these other ones are UK brands that I'm sure you recognize. Now, the most recent target for us, as animal protection organizations, is McDonalds. McDonalds is the world's largest restaurant chain by revenue. They serve 70 million people every day. So we know that this is a brand that people recognize. It's a brand that needs to change. In the US, there's a coalition of organizations; Animal Equality, HSUS, Compassion Over Killing, Compassion in World Farming, us, and Animal Equality have come together. We have launched a campaign over there. Here in the UK, you can see here, we've started campaigning as well. That includes protests, includes handing in petitions, getting people in the streets to be engaged with the issue, and also doing protests outside of restaurants. In the US, they've also got advertising in Times Square. Now, volunteers do take to the streets. We also have another way of trying to get the attention of these companies. That's through their social media and actually making contact with the companies themselves. We have something called a Fast Action Network. Other organizations have something similar that you can join. You'll get emails asking you to take a couple of minutes of your time to action against the companies. If you would like to join up, you can just go to the website. You can find the Fast Action Network. But really, this works by having a high volume of people contacting the companies. It really engages the companies and keeps reminding them that they need to be working on this. Of course, they worry about their brand, so it's important that we make sure we're heard. Now, while getting these welfare standards through institution change is making a big impact, we also know that replacing animal products with plant-based or maybe cultured meat one day is the future, where we can be sure animals don't suffer, would be great. In reality, it makes sense for companies as well. There are far fewer issues with plant-based products when you think about antibiotic problems, or greenhouse gases, or carbon footprint, for instance. With these cage-free commitments, as an example, companies are actually seeing how difficult it is for them to go down the supply chains, and try and find out, is the company actually using a cage-free egg. What they're doing is, instead, they're switching up. How can we take this out completely and replace it with something plant-based? It's much simpler for them. We know that this is working, and that the plant-based products are much higher welfare. They're also gonna be helping reduce suffering year on year. It's not just these commitments from companies that we're gonna be working on. We really need to follow through and make sure these commitments come into fruition. But there's also another way we can do that, and that's through legislation. In the US, they've been working on state legislation. 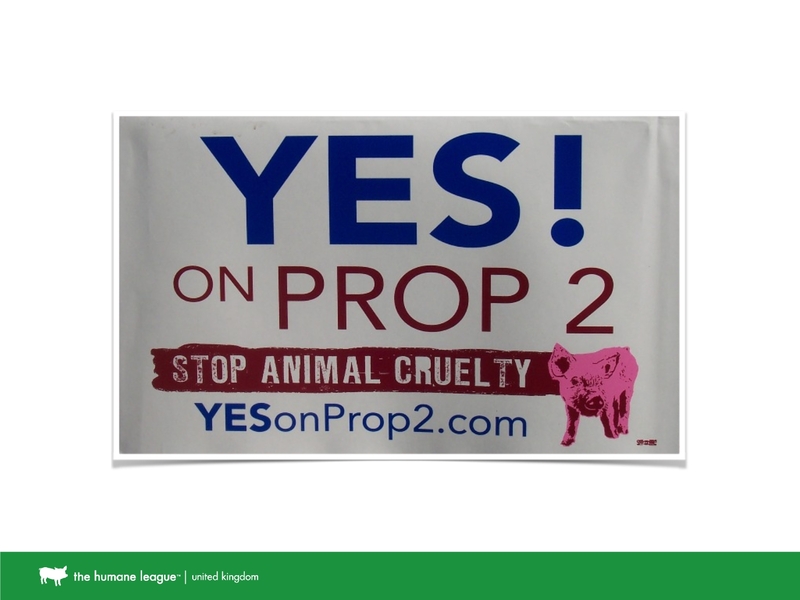 They have Prop 2. They have Prop 12 in California, which will be voted on just a few days from now. That one ends cages for hens, for pigs, et cetera. Not just on what's happening in country, so the production, but also imports coming in the state, also imports coming into the state. California makes up 10% of the population, so it's not a small thing. It will impact the whole industry. Over here in Europe, we have something called the European Citizen Initiative that's being run by Compassion in World Farming. In fact, they've got organizations in all the European countries to work on this and collect signatures to end cages for hens, ducks, quails, rabbits, pigs, calves. That work is gonna take a year of gaining a million signatures, but should then be pushed through to the European Parliament. Really, this approach is bringing together both corporate campaigning, the plant-based alternatives, and also finally, legislation prohibiting these systems completely. 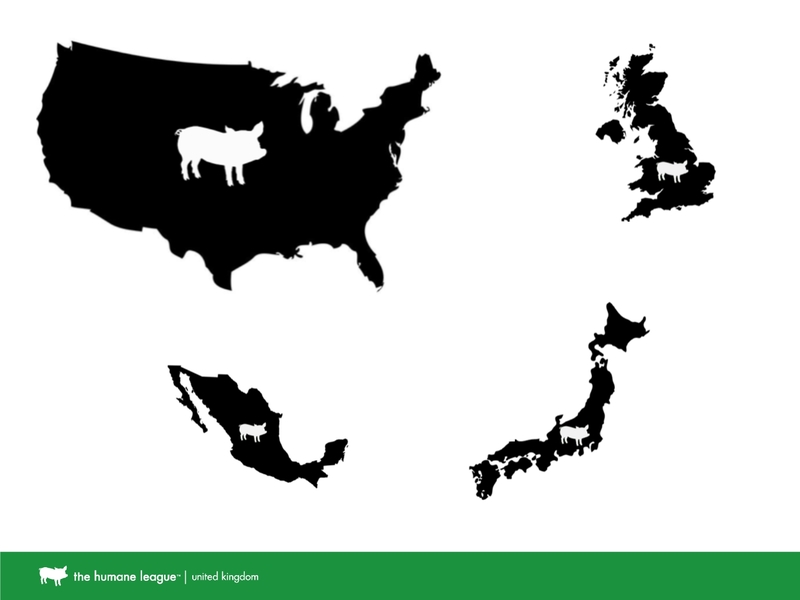 We're really now begin to see the landscape for farmed animals changing. We're already seeing the change for cages, hens coming out of cages. We're already beginning to be able to push through legislation. Now, we'll be able to say we are actually beginning to see the reduction of suffering of billions of animals every year. Question: To what extent are companies making changes because they feel public press is really pushing them, versus legislation in their country changing? Vicky: Yeah, so there are companies that are savvy and realize that actually this makes sense and that we can be the first. We can shout about it, and we can use it in our favor to say that we care about welfare. But many companies, unfortunately, that's not the case. When it comes to it, that's why we have to launch these campaigns. Highlight what companies are doing, the cruelty that's in their supply chain, and they don't want to be associated with that. It's a mixture of both. There are some companies that can see it, and there are the companies, the majority, unfortunately, where they need to have some kind of public pressure, and some kind of awareness before they'll make the change. Question: You said that for some companies, switching to plant-based actually is going cost saving in the long term. Do you have any idea how long it takes for them to use some alternative to chicken products profitably? Vicky: I don't know. There's companies looking to replace, taking out a proportion of like 20 or 30% and replace it with plant-based, so that they can reduce the amount of meat that they're using. With the eggs, it's probably proven quicker for them to do it. Some supermarkets will have 2,000 or 3,000 ranges with ingredients that include eggs. That's an incredible amount of lines to be going through. For them, it's easier if they can just say to these companies, "Actually, I want you to replace it with this," but I don't have any strict timelines and what that will look like, unfortunately. Question: What makes that corporate campaign more likely to succeed? Are there some basic principles across countries? Does that really depends on where you are? Vicky: That's a really great question. It does depend where you are. In America, legislation is such that you can do quite a lot that you couldn't do here in Europe. You can do more things that maybe the public doesn't see but you can campaign almost internally to the companies. Yes, here in Europe and within countries in general, it depends. We found, for instance, that in the UK it's been really effective for us to make them see us day in, day out outside their headquarters. There's a finance manager or whatever that's feeling bad because they're involved with this company that is actually enabling cruelty. They probably haven't thought about it to that extent before. But you're standing outside their headquarters and saying, "This is the headquarters of cruelty," which is what we did for Noble Foods. That bothers them. They begin to think about it. Every country has a different approach based on what's effective for them, but certainly, getting out there and doing kind of silent protest, being noticed by the companies day in, day out makes a big difference. 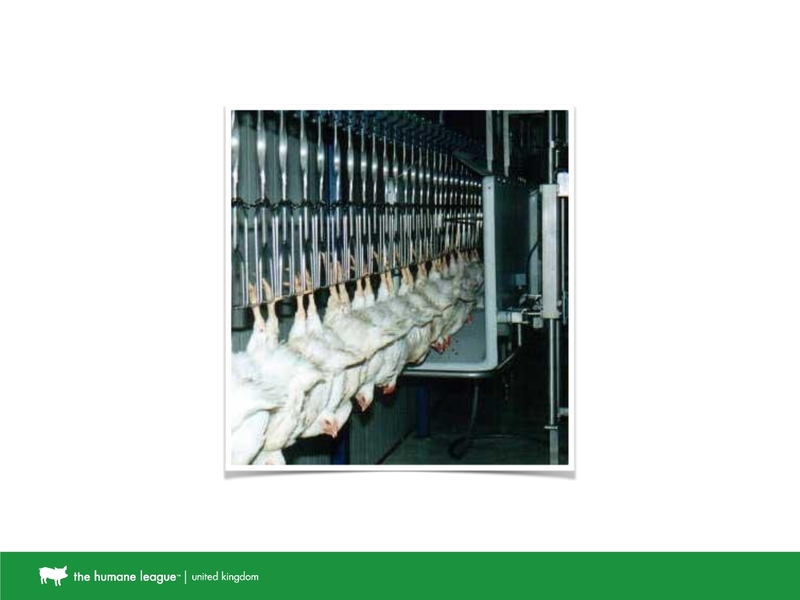 Question: You focused on chickens' welfare in your presentation. Can you speak a little bit more about similar campaigns for other farmed animals? I'd be particularly interested in fish, if there's a campaign in that. Vicky: Sadly, there isn't really. There's World Fish-Free Day, I think it's called, or something like that. That's happening in March next year. That will be a big thing. I think most organizations will talk about that. But I know that Compassion in World Farming are beginning to start campaigning on the humane slaughter of fish. That will be up and coming so that's really exciting and that'll be expanding in Europe probably to start with. Question: As a final question, if someone wants to go into corporate campaigning, what's a good way for them to get involved? Vicky: Oh, great. Well, just put yourself out there as an activist, starting to volunteer, learning the tactics that we use is really helpful; because then you can also go to the companies and say you were involved in those tactics, and they'll know exactly what's gonna happen. Also, if you've got sales background or that kind of thing, that kind of attitude can work really well in going and talking to corporations.